I had a chance to visit Richmond Virginia's award winning Lewis Ginter Botanical Garden last week while traveling to speak at the J.C. Raulston Arboretum in Raleigh, NC, and I wish I had scheduled more time to explore around the property. I only had an hour to spare, but I was able to see much, enough to possibly draw me back again for a longer visit whenever I am in the Richmond, VA area. I was so surprised but the size and design of this garden which in many ways could be called the Royal Botanic Gardens of Richmond. With emphasis more on decorative displays and ornamental horticulture than botany and collections, the Lewis Ginter Botanical Garden is surely what the public expects to see when they visit a botanic garden today. The Bloemendaal House featured turn-of-the-century architecture on the property, making the entire garden feel more like someones estate garden than a public space. It seemed to be a popular wedding venue with formal gardens and long paved walks under giant, shady trees. 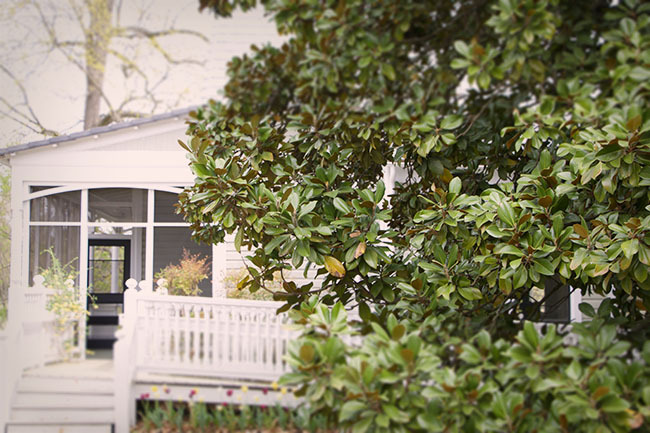 Southern Charm. A philanthropist and businessman in the late 1800s, Lewis Ginter's gift to the city of Richmond was his home and gardens which eventually became the Lewis Ginter Botanical Gardens. 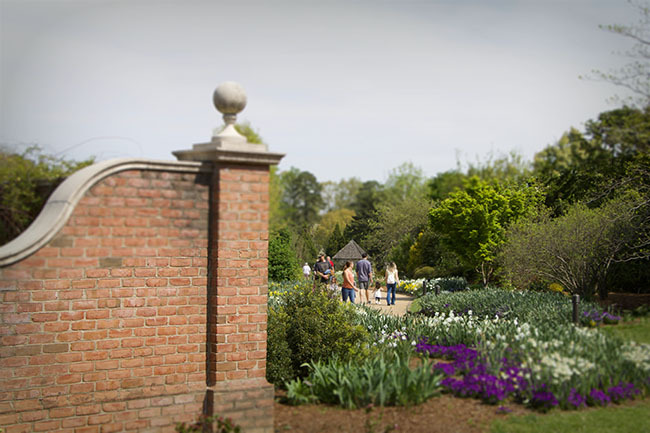 Recently, the Lewis Ginter Botanical Garden has been receiving many awards and recognition - most noteworthy it was named as one of the Nation's Best Botanic Gardens (fourth) by USA Today. 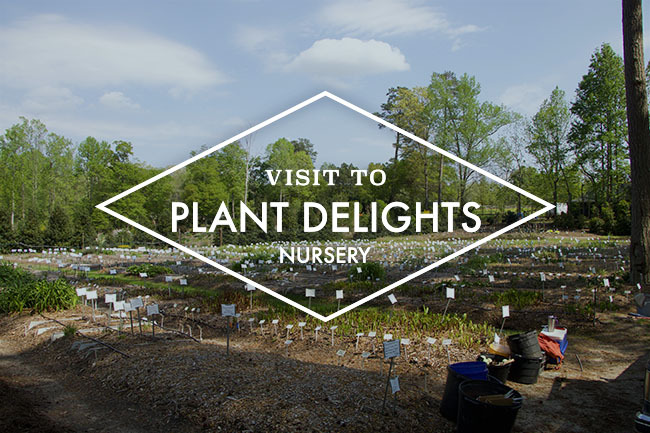 I've been ordering from Tony Avent's Plant Delights Nursery since it's early years - dare I say perhaps since the mid 1990's when the catalog was still being printed in just green ink (without photos). In many ways, it taught me to look things up (before the Internet) and thus, learn not unlike the original Heronswood Nursery catalogs did. 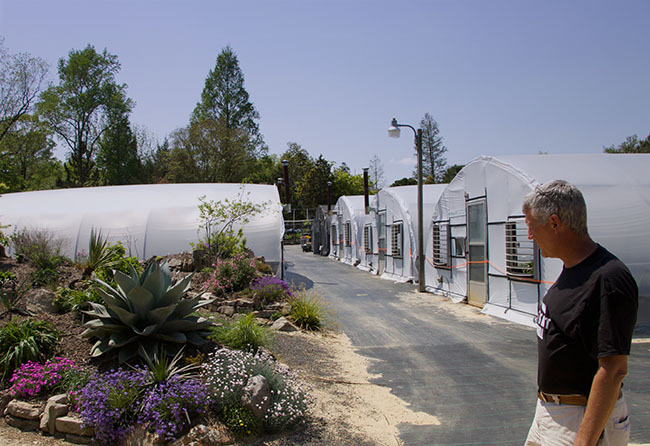 Tony Avent overlooks a range of hoop houses in another section on the property where propagation occurs. Every spare space us used, and planted with trial plants to observe how they might grow in various conditions. 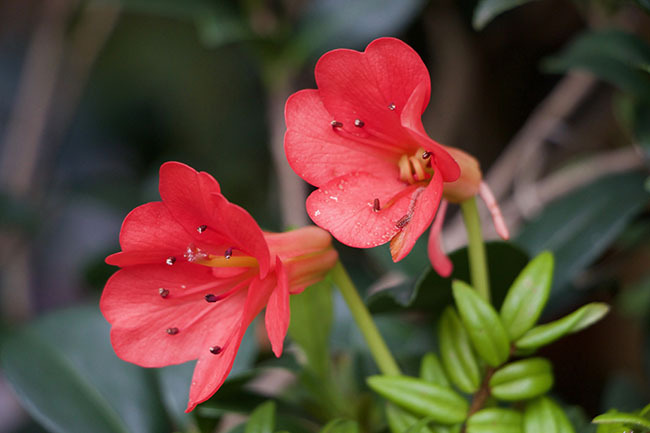 I am a huge fan of Tony's efforts, and jumped at the opportunity when my friend Bobby Ward a well known plantsman and author himself (author of Chlorophyll in his Veins - J.C. Raulston Horticultural Ambassador). Indeed, there is a spirit in Raleigh, NC were in this land of the late J.C. Raulston, knowledgable plant people just congregate. 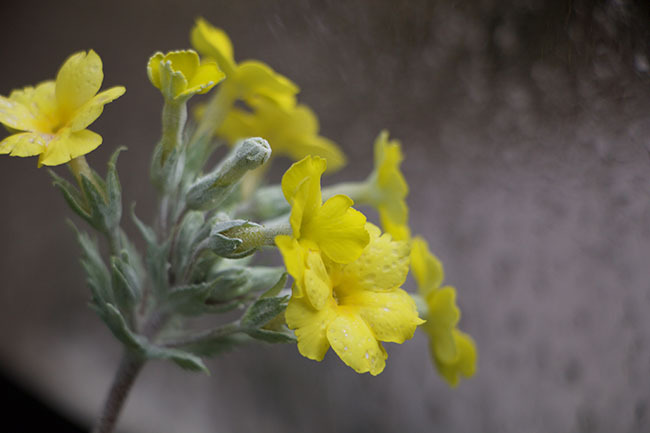 Bobby offered to drive me down to the Juniper Level Botanic Garden from the J.C. Raulston Arboretum where I was speaking this weekend to see exactly what delights where being cultivated by Tony Avent. I had no idea what I was about to see. Why do we love alliums so much? In the garden ornamental species delight and put on a show few other bulbs can compete with, but it's the vegetable garden - or shall I say in the kitchen where the genus really delivers. Leeks, shallots, garlic and bulb onions - what more can I say? Humans would miss alliums as much as salt, but that won't happen - at least in my garden. Recently, as I prepare for a new growing project, I am finding myself deeply interested in mastering the culture of culinary alliums - onions, both large sweet and hard, storage types, green onions fresh and tender, giant leeks for soups and braises, and then the more unusual alliums, from small boiling onions to our own native species - the ramps. I can't grow them all at one time, but this year, I am revisiting a few for this project - and beginning with the most common of all, the onion, I felt that I should share what I have learned, from expert growers in England who raise onions for competitions where some can reach silly sizes near ten pounds each, to new methods for raising onions that's changing how many of us raise these kitchen staples in our own gardens. Onions aren't as fool-proof or easy as one may at first think. Sure, one can shove a few onion sets (small bulbs) into a pot, a window box or in the garden and still harvest reasonable shoots, green onions and perhaps a crop worth eating, but more often than not, the final harvest results in something more akin to extra hot small onions hardly worth the trouble. Here are some facts to top-line what I've learned over the years. 1. There are two groups of onions, broadly speaking - long day types which are the hard storage onions such as yellow Spanish, white and red types - the sort we all use for cooking in the kitchen all winter long, and the type that can make us cry, and then there are the short-day types- those sweet Vidalia and Walla Walla onions, high moisture content, with little patience for storage. If an onion comes from Oregon, Washington or Georgia, most likely it's one of these sweet types - and while a favorite of many, do know that while many will suggest advice for growing these in the North, if one lives in the North East, they results will always be less than fabulous when raising these sweet, winter growing onions, for our season is simply too short. For practical reasons, I am going to limit the onion portion of this post to a focus on the summer growing, long day length onions, as these are more growable elsewhere outside of the Pacific Northwest and the south. 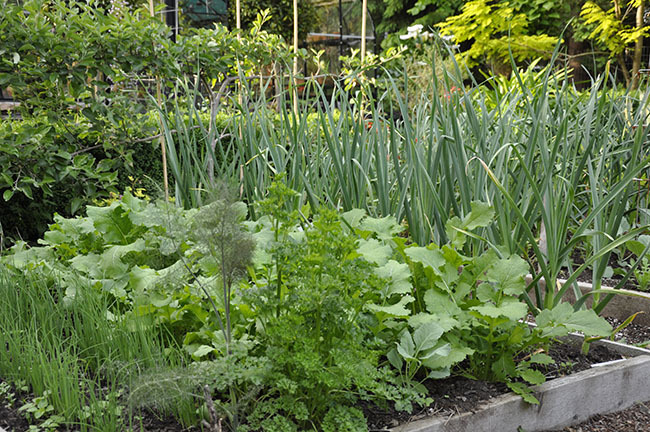 Many in the onion family enjoy raised beds, but not pots or containers. These leeks and green onions (foreground) are interplanted thickly with some early white turnips and a couple of parsley and self-sown dill plants, but in a few weeks, they will have more space in which to mature once the turnips are ready. Onion seedlings in a seed tray. Sown in February, these are sown closer and divided later, but the best results come from seed sown individually into seed cell trays, where each seedling gets their own little pot. THE BEST QUALITY ONIONS COME FROM PLANTS RAISED FROM SEED - Serious onion enthusiasts are extremely particular about both the varieties of onions they grow, and about how they raise them. Often raised for competition (really, just check out the many videos on Youtube on raising exhibition onions so enormous - 5 lbs - that one would feed a family of 10!). 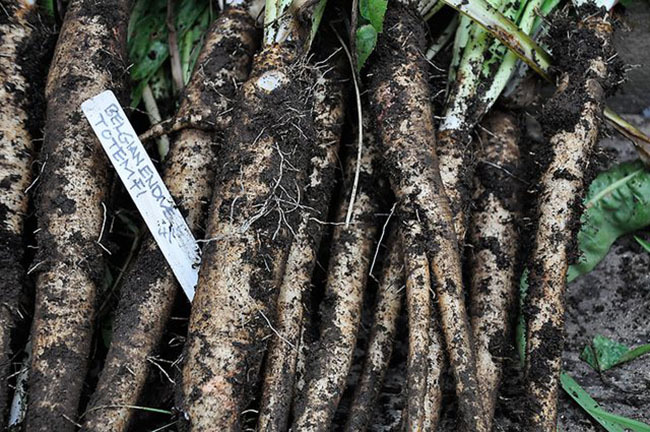 Good varieties are hard to find as sets, but pre-started seedling or young onions can now be found offered by some plant catalogs. 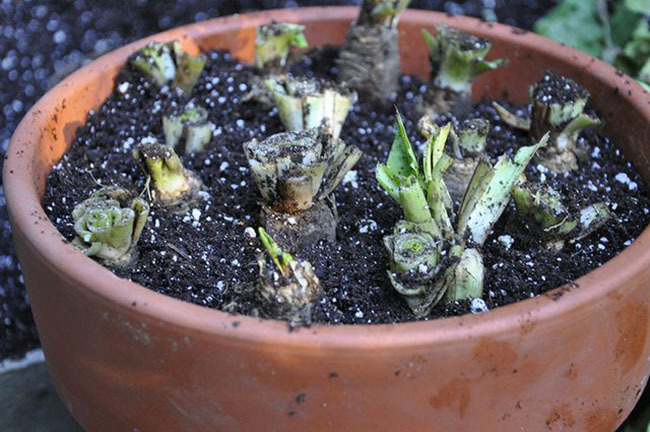 They may look dried out a bit, but most will produce larger bulbs than onion sets. Onion seed must be sown very early - Many gardeners sow seed as early as January in the Northeast, sometimes I wait until mid February but any later and one might be better with onion sets or onion starts. Grow seedlings cool and bright, raising them under grow lights or in a cool greenhouse. Onion seedlings transplant well, so one can raise many seedlings in a flat - cells are not necessary and one can carefully separate plants with little harm. 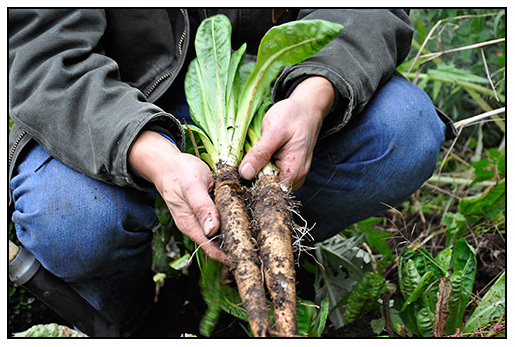 You may be wondering if you could simply sow seed early in the ground directly, and the answer is yes - in fact most commercial farmers - the onion farms raise their plants from seed directly sown, even in the north, but the challenge for home gardeners with seed sown directly will be weeding and timing. Onion seedlings are slow growing at first. 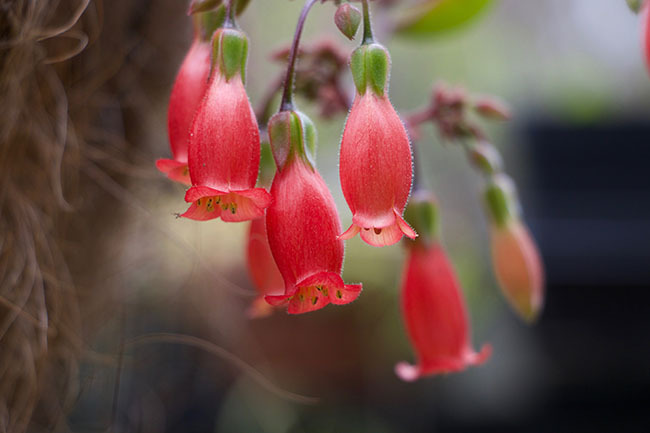 With early snowmelt, the seeds can be sown as soon as the soil can be worked, perhaps in late February or March in New England, or in Minnesota, seeds are can be sown as late as mid- April outdoors, but most growers will recommend seedlings started indoors for practical reasons - as the home grower will only need a few dozen plants, or perhaps a hundred or two, and seed raised seedlings grown without stopping will produce the largest onions. Now, size isn't the goal here, for who really needs a 5 pound onion, but a one pounder is fine, as is a half pound onion. I believe that a range of sizes in more useful, but if you've ever raised onions from sets in a hot summer, you know how useless onions sometimes become - small, hard and spicy hot, a few unappealing golf ball sized onions makes the idea of raising them unlikely. 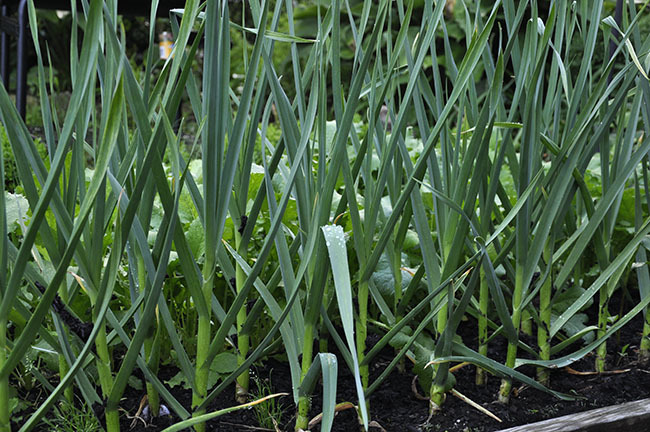 Here are my tips for how to raise the best onions in the home garden. 1. CHOOSE NAMNED VARIETIES - Start with good varieties for your area - this means selecting hard storage long day length onions if you live north of the 35th parallel and raise onions in the summer, or choosing super sweet types if you live in the Pacific Northwest, Texas or in Georgia, south. Onions are ridiculously heavy feeders which I know might turn some gardeners off given current trans and thoughts about fertilizer, but the facts are simple - rich soil and frequent applications of nitrogen will give you onions like those found in the stores. If you was small onions that are too hot to eat, then just plant onion sets, little to no fertilizer and let them dry out often - but who needs that? Now, if you decide to just swallow your values and fertilize, there are a few options - some growers have success with organic sources, so feel free to try kelp and fish meal, but really - with onions - chemical sources will get you the best results. In order to simplify fertilizer tips here, let me just lay it out there - onion crops require A VERY rich soil that is very high in nitrogen and phosphorus. Onions are bulbs, and like most bulbs with scales that are modified leaves, they require a growing season with early nitrogen sources, uninterrupted moisture - which means drought will force onions to bulb-up too early - and a good, consistent source of phosphorus. In addition to high nitrogen, onions need the right balance of minerals, trace elements and sulfur. Given this, onions are one of those crops which I like to geek-out on when it comes to nutrients. I buy separate fertilizers (most are Espoma brand). This will allow you to apply a band of pure granular nitrogen and phosphorus. alongside plants. While most summer vegetable crops will produce well with one application of Nitrogen, onions demand much more - most growers depend on 3 or 4 applications. However, one can over-do it with Nitrogen. One must stop applying nitrogen 4 weeks before harvest, as onions can get too lush with continual applications of Nitrogen as plant near harvest size. 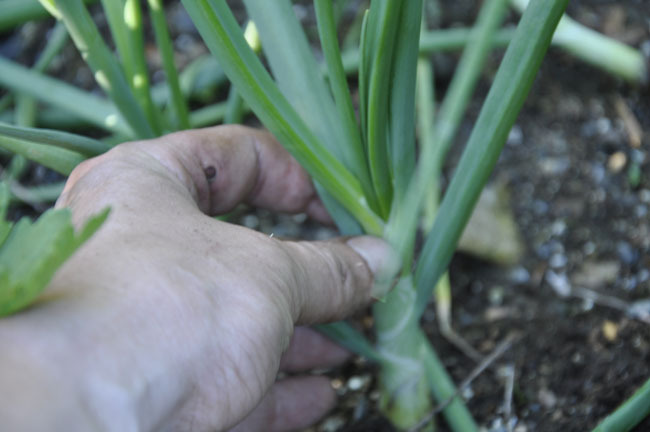 Excess will produce onions with thick necks (stems) and will also inhibit maturity. 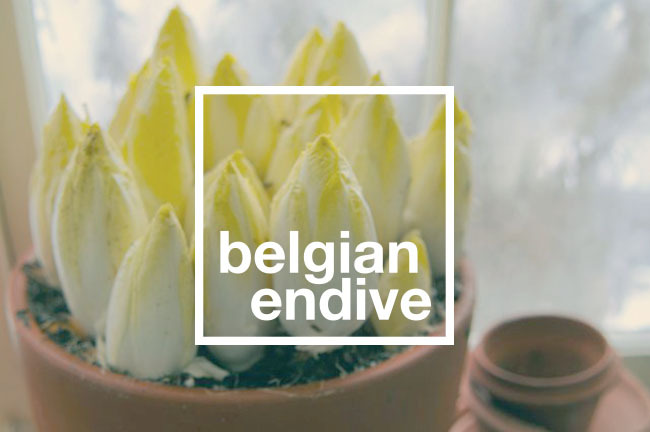 It's all about balance, as as with many ornamental bulbs - they want to start out and grow early with lots of Nitrogen, but gradually wean themselves off to a diet higher in Phosphorus. Remember, they are bulbs. If your soil is low in sulfur, a bit added will help both the nitrogen uptake, and the onion heath - however, high sulphur can make onions taste hotter which something one may not want especially if raising sweet onions. For most growers, the basic knowledge about sulphur is this - long-day storage onions grown in the north are found to be able to access sulfur in soil more readily than southern grown short-day onions like Vidalia. Thankfully, in the North, the long day length varieties seem to be able to access enough sulfur from soils while supplemental sources must be applied more in the south. 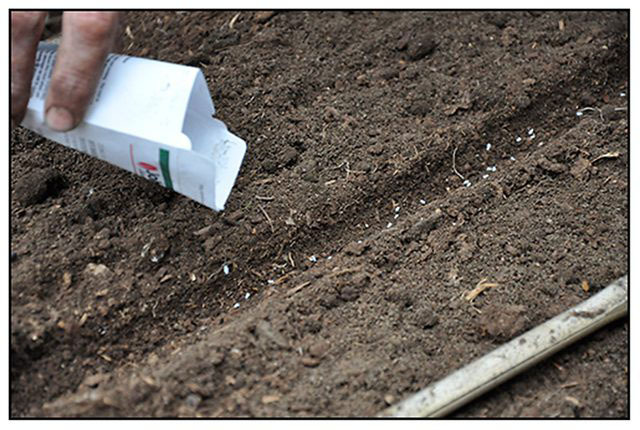 As with most crops, pH affects the availably of most nutrients, so be sure that your soil is tested properly, and this goes for onion bed soil as well. The optimal pH range for onions is 6.2 - 6.5. 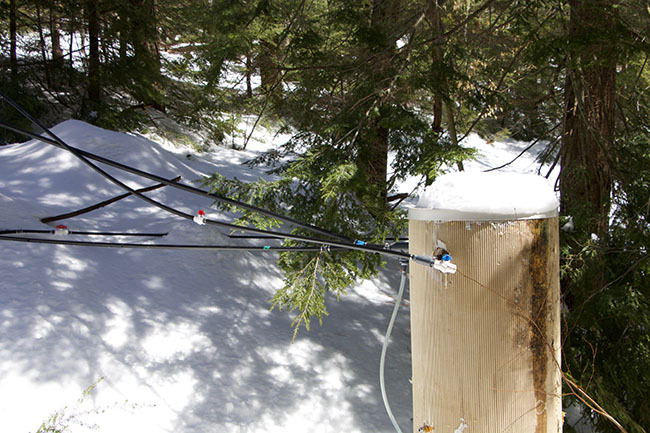 Use dolomitic lime to reach this range if necessary early in the season. If you are serious about growing your own food, do yourself a favor and purchase a rechargable electronic pH meter and take the time to adjust the soil based upon crop needs. Onions just happen to be one of those crops which can produce significantly better crops in the home garden if the right nutrition and pH rules are follower precisely. I like to take some tricks and tips from the highly competitive exhibition onion growers (in the UK) and from the onion farmers who raise crops for commercial distribution. Most growers know what onions need, and be they conventional or organic, take heed when it comes to keeping onion crops happy and productive. First, most apply a band of Phosphorus (0-20-0) directly under the layer of soil where you will plant - the reasoning is that strong early root growth will enable plants to access more moisture and nutrients. Some organic growers use kelp meal which offers micro nutrients and minerals, as well as a granular humic acid augmented with high nitrogen fish emulsion. A slow release nitrogen source could come from an application of cottonseed mead turned into the soil in the autumn, but as it can take long to decompose and become useful to onion plants, the soil would need to be Warmer than 60 degrees as plants find that accessing Nitrogen in cold soil futile. Don't waste your money. 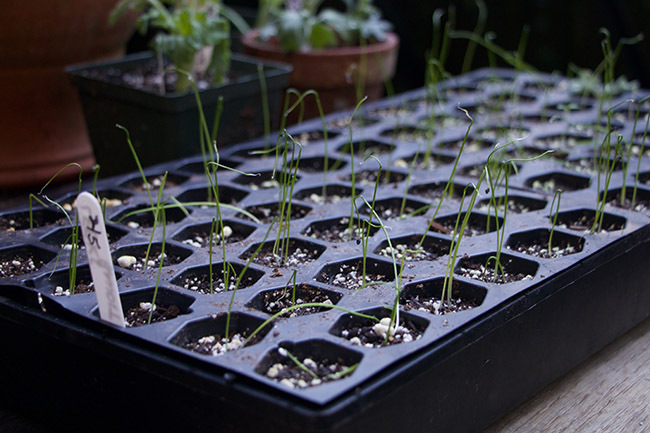 Raising onions and leeks in cell trays will give you better results when setting out in the spring. 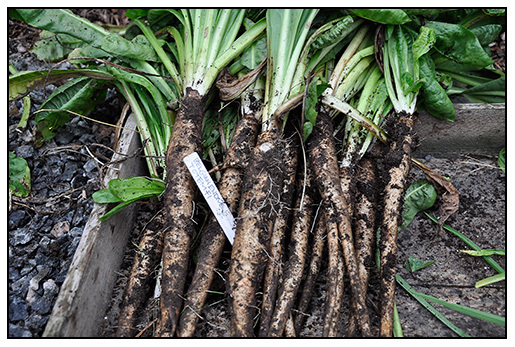 Many home gardeners in Zone 5 -6 find seedling starts available via mail or at the garden center, which are an acceptable option to onion sets, but often they lure the home grower into thinking that they can raise a southern winter short-day variety like 'Walla Walla Sweet' or Vidalia. Sadly, the results are often less than satisfactory given summer heat and day length so look for bundles of storage onion varieties instead. Weeding is an art when it comes to onion culture. Space, and no competition helps. The storage onions are often large, yellow or white storage varieties selected as good storage or exhibition varieties that can grow large such as 'Ailsa Craig' (not 'Alisa Craig!) or 'Patterson'. Tow varieties I am raising this year in addition to an heirloom red. Onion seedlings can be sown thickly and divided when planting, but I now opt for growing them singly in cell trays, which gives me a larger onion. Choosing between onion sets, onion seedlings or those from Seed? Honestly, I grow onions by all three methods, but the best varieties will come from those raised from seed. The challenge with raising onions from seed isn't difficulty, it's that they must be started early - often as early as January. Bright sunlight will ensure the strongest plants, and a greenhouse is ideal, but artificial light if one can keep plants cool, will work too. 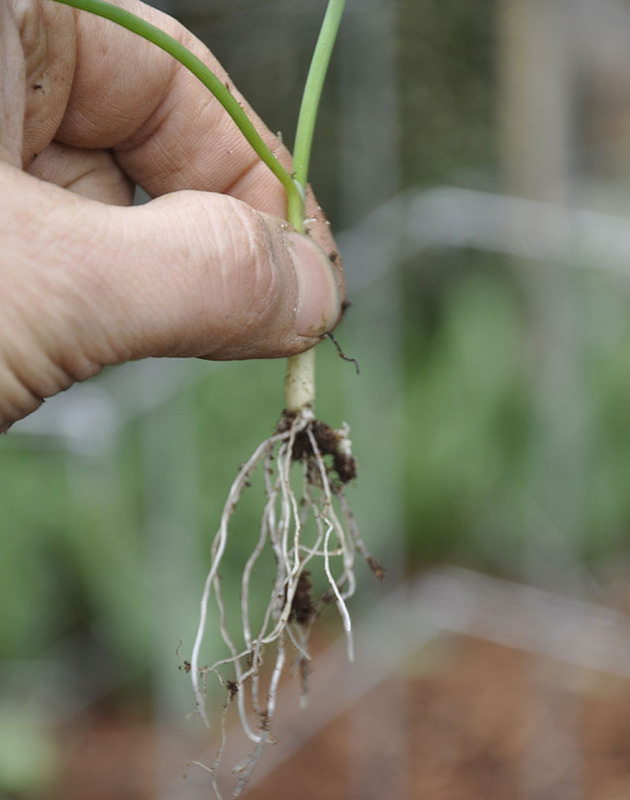 Adventurous and serious growers will sow directly outdoors, but as with green onions, this takes longer both for germination and the challenge of identifying onions through the weeds. 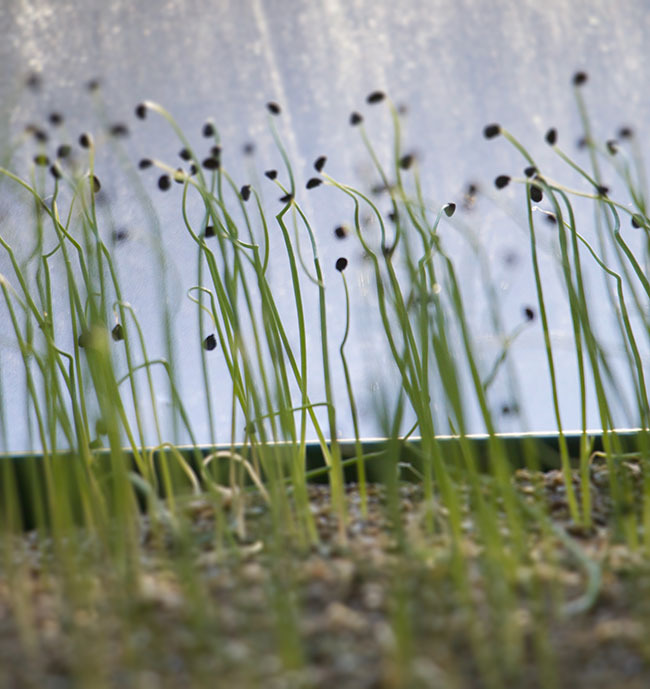 Pre-Started seedlings sold in bundles is an excellent option, or onions sets, which are essentially boiler onions grown to a small size, and then harvested to be set into the ground in the north. These have their advantages and also disadvantaged. They are the easiest to fine, but are more likely to bolt into bloom if subjected to stress (low moisture, heat and low fertilizer) which will render the onion useless, and they won't get you to the giant, spectacular onions which are possible from seed. The choice is up to you. Some competitive growers have great success with bundles seedlings of Ailsa Craig, which are available at many mail order nurseries if ordered early, but if you are a purist and want to raise a crop of onions that will supply your family with onions through the winter, plant on 2 80- foot rows raised from seed. I will say that Ailsa Craig has been the go-to source for nearly 100 years for exhibition onions ( I have a 1923 catalog with a full page ad for seed), but most of us must plan early irregardless of our sources and growing method - for onions simply require some knowledge to be able to master. Storage onions can be picked while green, but that will impact your harvest. If you want large storage onions in the late summer, keep them growing all summer long- and this means lots of water and food. Otherwise, they will go dormant by early August, and you will end up with small onions. 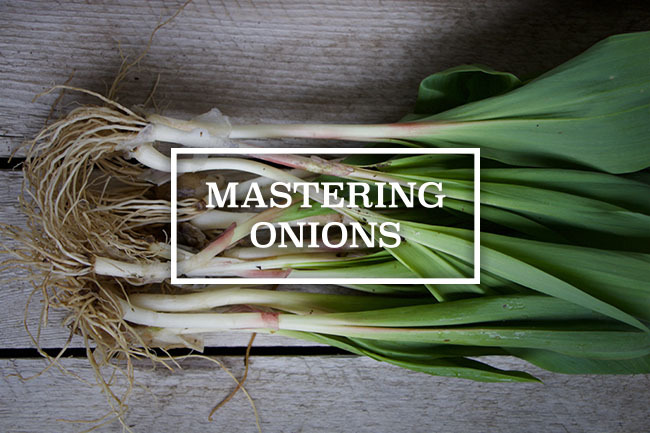 Have your onions ever bloomed before drying out? 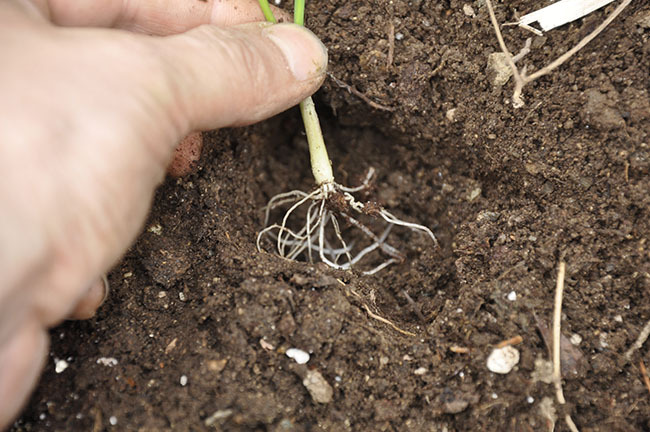 Onions can bolt into seed early if treated poorly, which will ruin the bulb, while others might 'bulb-up' early if grown lean or subjected to drought, which will result in small, hard onions. Nitrogen applied too late in the growing season will stimulate voracious growth which will result in onions with thick necks or stems, and basically won't 'turn off' the onion from growing. This can result in an onion that won't dry out well, or store well. As most of us, I am assuming, are not storing our onions for long periods this really isn't a problem, but if you are a homesteader or planning on growing an entire year's worth of storage onions, note that nitrogen should be cut off 4 weeks before digging and drying. Green onions, scallions or scullions (?) are an entirely different crop. Specific green onion varieties must be used, many are Asian or Japanese, and very choice and productive as a home garden crop. The problem is that few people grow them well. The basics are that you must start with good varieties which are noted as being specific green onions, and you must sow them direct. This means no 6 packs, no sets, and no pre-grown plants. This can get a bit tricky for one reason - baby green onions in the garden can get lost- they look too much like grass, so weeding in the early spring is tricky. 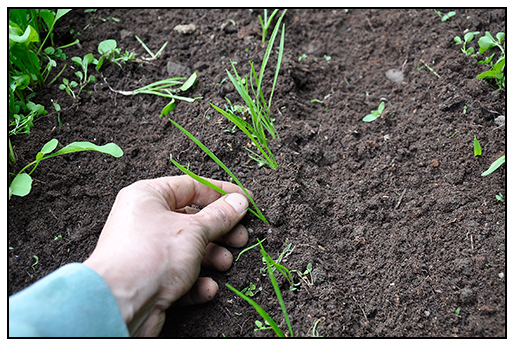 Green onions simply must be sown directly into cool soil early in the spring. After that, one just has to wait and observe. 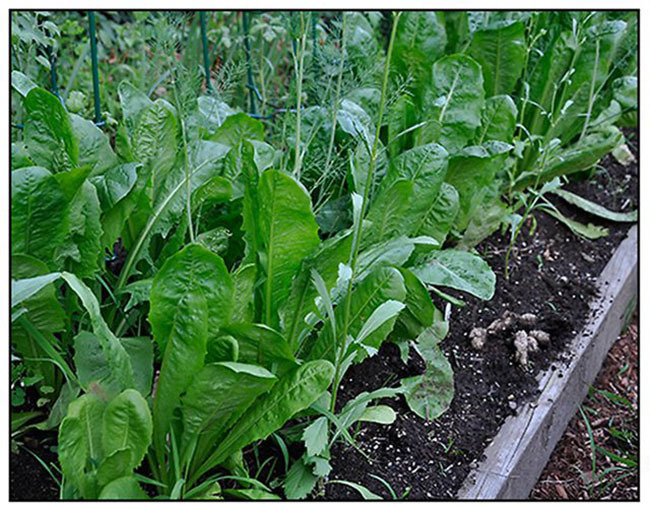 They won't require thinning, but they are slow to both emerge and to mature, not unlike carrots. Still, I highly recommend growing your own, for if you are like me, and cook often, they are one of those weekly staples and there is nothing like a bunch of freshly picked green onions - so superior to store bought. Sow seed just thickly enough so that plants can mature to be a half inch in diameter, (some seeds can touch). Tidy, neat rows are best sown in April and just note that they will look like nothing other than lawn grass until mid- June. After that? Plan on a weekly harvest until frost - great for the home chef and foodie, this endless supply of green onions (and yes, there are red varieties too) are superior in both texture and flavor than commercially grown green onions. They cut into tiny, crispy slices as they have never be crushed in a box and shipping buy air. I just love them. 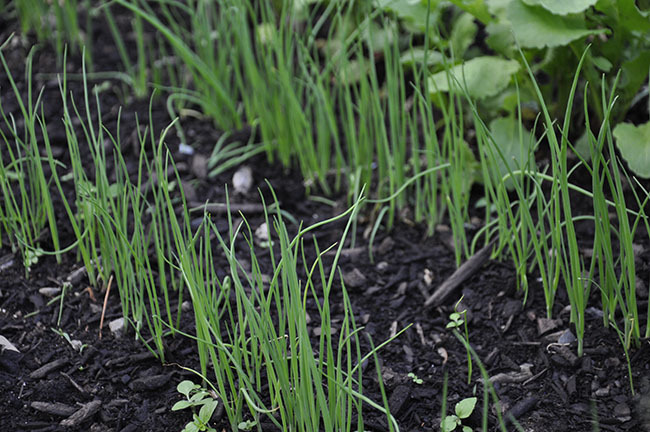 Green onion seedlings can be sown thickly, and can be confused with grass when they are young, but nothing beats a freshly picked green onion for recipes - ask any chef. Garlic and Leeks growing in my garden last year. Raised beds works well, but avoid culture in containers unless they are large, raised beds or 100 gallon drums - leeks need space. Leek culture is fun, but they do occupy space year-round, requiring an early start via seed indoors in January and then setting out in early spring into stone free sifted soil which - well, let's face it - there are some financial leek growers around (such as men who live in the UK like these guys), In American, the leek suffers from a lack of history in both cuisine and in garden culture, which is ashamed, for in so many ways, it is the queen of the alliums, adding subtle flavor and gentle elegance to most every dish it is added to, let alone the joy of braised leeks. Whenever I cook with leeks someone will comment on their lovely scent, with warm butter and olive oil, the scent of leeks is sublime. Leek seedlings are planted deep, in a trench and in a hole in early April. Soil is then hilled in, as the season progresses - the goal here is to achieve a long, white stalk with green leaves higher up on the plant. Competitive leek growing in the UK aside (saving that for another post! 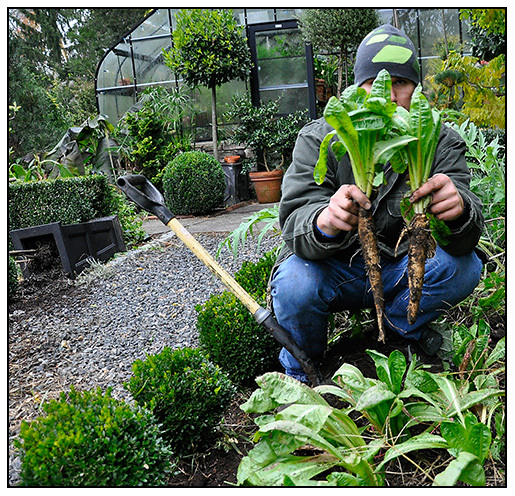 ), in our home gardens, leeks can offer a challenge, but if one chooses to grow leeks in the home garden, one can assume that one is not only a more informed gardener, but surely a bit competitive - at least, not one to shun when challenge is faced. Leek growers tend to 'bring it on' when it comes to growing their vegetables, and actually enjoy taking the extra steps to achieve leek greatness (the same goes for parsnips by the way!). James Crockett of PBS' famed Crockett's Victory Garden show from the 1970's introduced many of us to the specifics of proper leek growing, which begins with sifting compost and soil as one would do for a deep, soft, friable soil often reserves for perfection of root crops like parsnips and carrots, but since leeks are not technically a root crop but a bulb, they demand extra soil amendments and treatment throughout the season, beginning with a rich soil with added compost and nitrogen, but also planted deeply as seedlings, sometimes nearly a foot deep if the seedlings are long, as just a few inches are needed to emerge out of the soil. Most growers begin with a trench, with added composted manure, hilled to the side, and then brought down to fill the trench as the seedlings grow through the spring and summer. The competitive growers can offer us some valuable tips as well, even though our kitchens hardly need a leek which is 12 inches in diameter or a meter long. Small leeks are nice too, but there is no such thing as 'baby leeks' no matter what your gourmet market says. Small leeks are merely poorly grown leeks. The home grown leek is lovely in the garden, graceful in foliage and form, and a row or two of leeks can look attractive for the entire season. IN winter, they are one of the vegetables which can be harvested late, after frosts and sometimes even in snow (however, protection will be needed in the far north, nothing that a deep mulch of straw won't fix - the truth is, leeks will freeze if temps drop too low below zero.). Leek seedlings in my greenhouse this year, in late February. 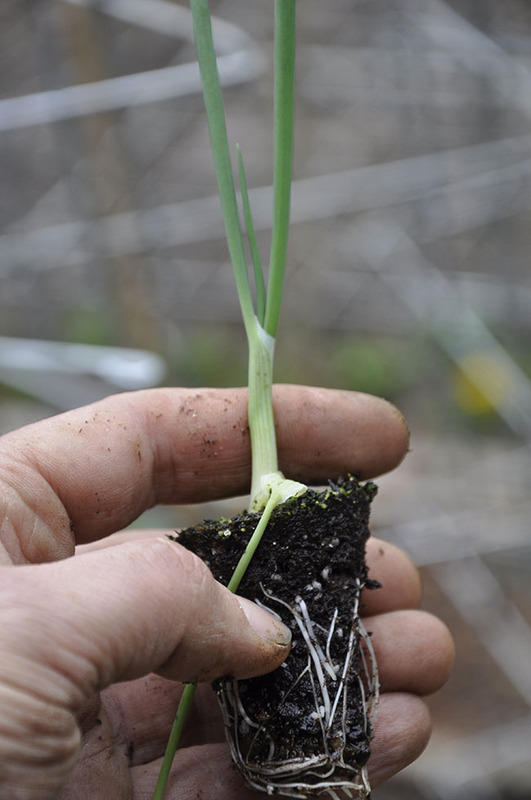 I start my leek seed early, in most years late January or early February as the seedlings can be tiny and grass like. Leeks are the first seeds I sow for the coming season. The Brits are more aggressive, starting their seed in November or even earlier in cold greenhouses, but that is both impractical and not that effective for those of us in northern North America, but the goal is to have strong, leek seedlings by mid April to set out into the prepared bed. Seedlings should be pencil thick, or about a 1/4 thick if grown well. Trenching is the traditional method of growing leeks, with seedlings set in about 6-8 inches apart while I prefer 9 - 10 inches as I like to get leeks growing rich and thick. I use a granular 10-10-10 mixed into the soil first just below the surface scratched in, and then topped off with a water soluble feed to kick-start root growth and to take advantage of cool weather growth. Leeks are one or the few veggies I set into the grown using a dibble - a pointed stick, which makes a nice, deep hole perhaps 6-8 inches deep. Any stick will do of course, with the goal here to set the seedling in deep. A bit of soil filled into the hole is required, but newer methods are emerging, most advise the grower to allow the rain to fill in the rest of the hole with soil as the leek seedling grows. In the UK competitive leek and onion growing is practically a sport. 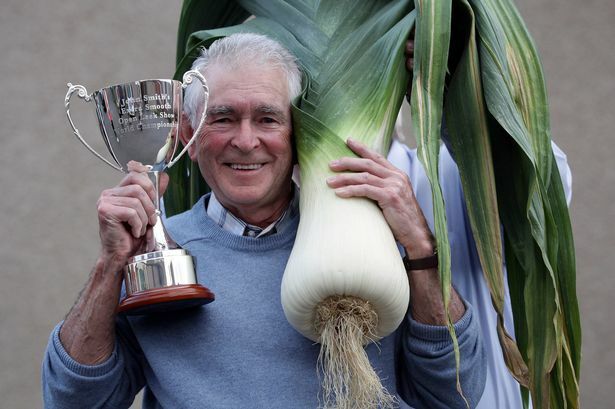 (photo courtesy of The Mirror) but visit You Tube and search for Competitive Onions or Leeks and see what exists. If you want to try growing a leek larger than a child or a ten pound onion, you will be thrilled. To achieve such size, growers have many secrets, but most begin in the autumn of the precious year with sowing seed in cool greenhouses. 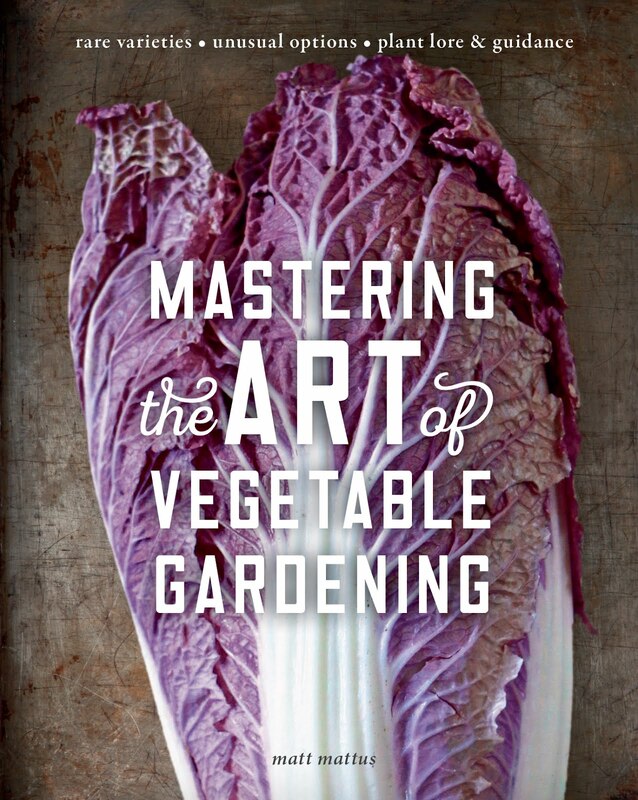 Since soil is key for leeks, nutrition is something one should take some time to perfect. If you didn't have success with leeks in the past, it's more likely due to soil nutrition than anything else. The truth is, leeks are one of those vegetables referred to as 'heavy feeders', and balanced is best (10-10-10), while 10-20-10 might be more effective if you can find it as technically, the plant is a bulb. If you can find an organic food with this analysis the certainly use that - I use both organic and chemical fertilizer as I am a horticulturist and home grower, and err on the side of most horticulturists that all fertilizer is chemical (hello periodic table), but if you go all 'organic', note the analysis particularly with fish emulsion which can be higher in nitrogen which you want to avoid. A dry organic mixture is OK for use with leeks as they are a long-season crop, and granular dry mixes often need more time to become available to plants, but will require soil prep in the following autumn to provide maximum effect. Leeks are rather care free throughout the summer however, with good watering and a monthly feed will suffice, and some hilling of soil might be necessary. Beyond that, by late summer or autumn, the leeks will look large and spectacular in the garden, and if so, may just need some careful lifting as needed in the kitchen with a pitch fork around October. 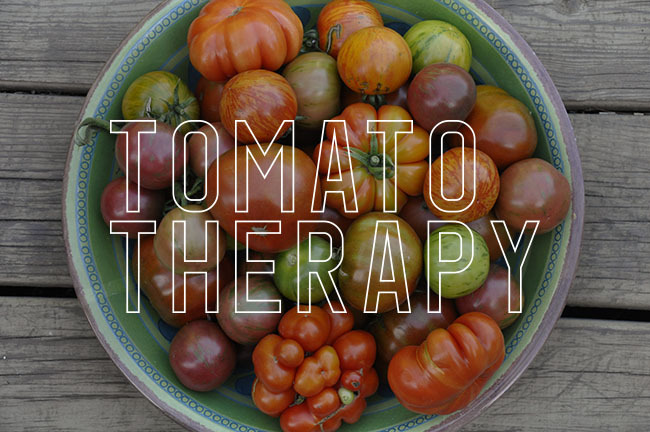 Leave the rest in the garden for use on an as-needed basis. 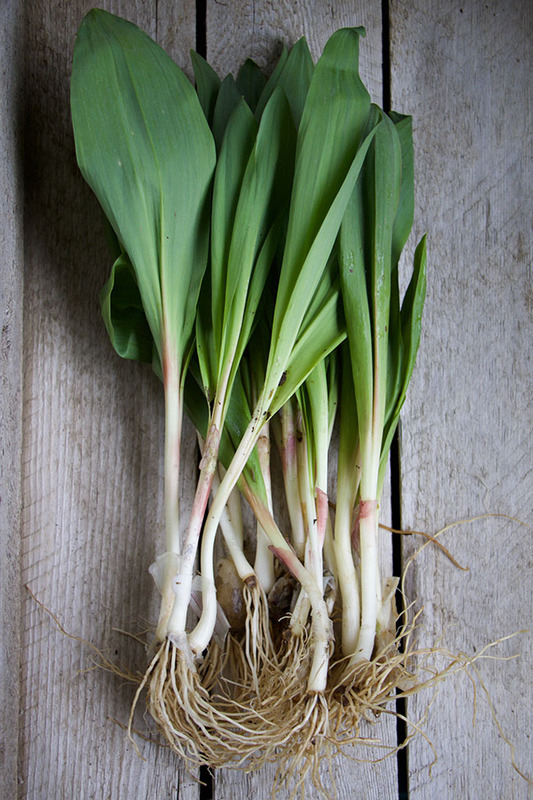 Ramps are a rare, seasonal treat in the North East with a flavor which combines garlic and onion. Are they over rated or not? Well, they can only be foraged and while a few farms are raising a few in beds, they are unlikely to ever become a big, commercial crop. They still offer a delightful option to many foodies during the few weeks when they are available. Ramps - the luxury of rarity. Ramps both delight and confuse me. To be honest, I buy mine from a secret source but I am always confused as to how to cook them and enjoy them, it's not above be to simply acquire something just because I know it is rare - I figure that I will learn to appreciate the item after I figure out how to appreciate them better (my cilantro theory, the goes for raw oysters, avocados and kidneys - the may come from some strange competitive gene that only appears in the youngest sibling who wants to earn some weird exclusive respect from their parents simply because their older siblings 'failed' such 'tests'. Why is it that native treats - those picked in the woods or found while one is foraging which are usually the most sought after by b both foodies and plant people. Spring is the season for Ramps - the frustratingly rare and hard-to-afford $20 a pound woodland allium which shows up in fancy food markets for a few weeks in April even around here, although New York State is the chosen spot where it grows wild and is foraged. 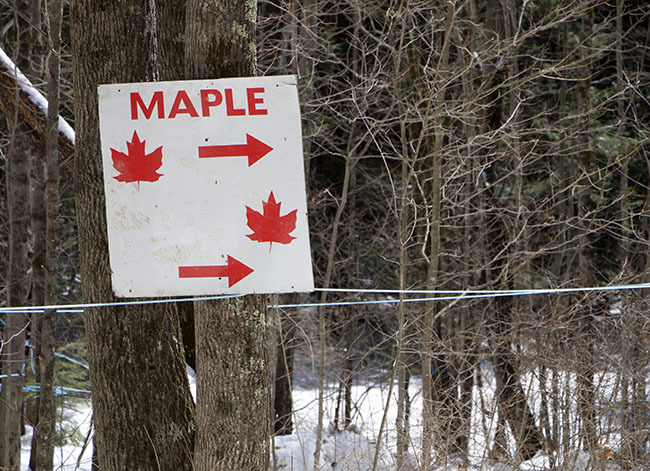 It doesn't take many words to say "maple syrup", as this road sign posted by the Wells Family on their sugarbush which was still actively producing maple sap this past weekend in Dublin, NH. 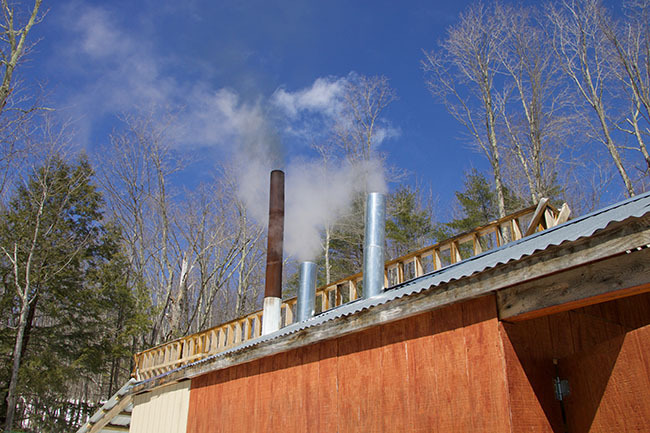 The blue pipes in this pic carry maple sap back to the evaporator located in a steamy, wood-fired sugar shack - the perfect way to spend a Sunday in early spring in New England. Here in New England, winter has yet to leave us. To be more precise, winter just arrived this March as it was the coldest month of the winter season this year, which has played havoc with maple syrup producers, as many started tapping their sugar maples as early as January this year as an early winter thaw brought on the ideal conditions for maple sap activity - nighttime temps below freezing, and daytime temps in the 30's and 40's. 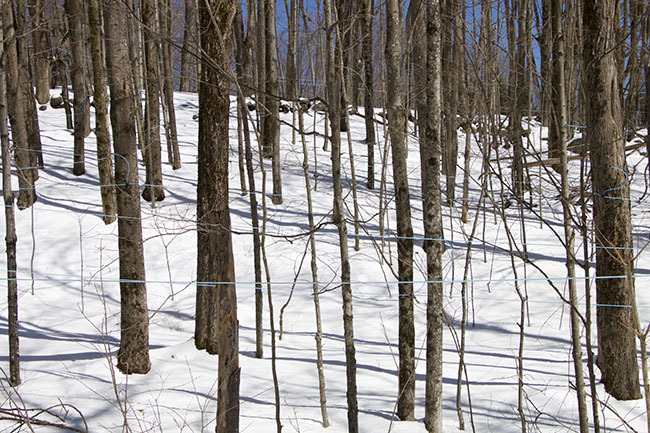 This weekend we decided to journey north to find an active sugar bush - a name for a stand of sugar maples which can be tapped for their sap, which is then boiled down and reduced to make maple syrup and other maple products. 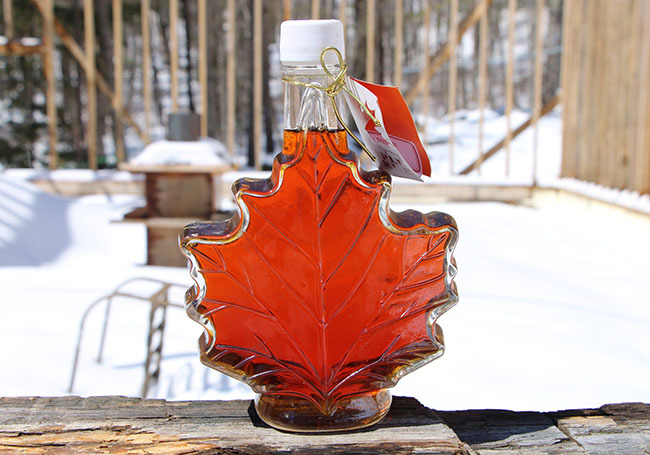 Syrup is graded into various grades based on color and flavor, the darker it is, the more flavorful it is, but often one needs to visit a sugar shack to get the really tasty syrup. Just an hours drive north of our house we drove to southern New Hampshire in search for some maple syrup sugarhouses that might still be active - last week most sugar shacks closed in the area, but after a big late winter snowstorm this week, I was hopeful that some trees might still be producing sap (they stop once they bloom, which can happen as early as mid March). We found a few sugar shacks that were still active. Instead of visiting a touristy site, we opted for the homemade sign on a back road, and ended up at the home of Toby Wells and his family, who are in their third year of sugar production. We couldn't have struck it better - a steamy sugar shack, hot syrup to taste and lots of home made maple products for sale. 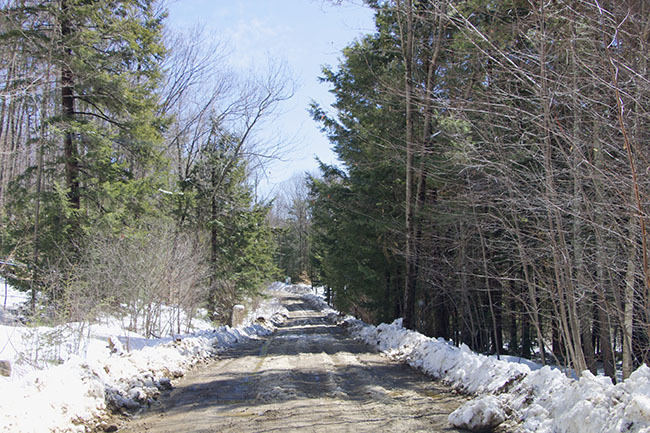 The WELLS FAMILY SYRUP farm is located on Fiske Lane in Dublin, New Hampshire and you can contact Kelleywells@outlook.com to purchase their delicious syrup, maple cream and other products. The sign led us down this road, barely plowed after yesterday's spring snowstorm here. We knew that we were on the right path, as we could see pipes and hoses leading down the hill, connecting all the sugar maple tree taps, to storage containers. 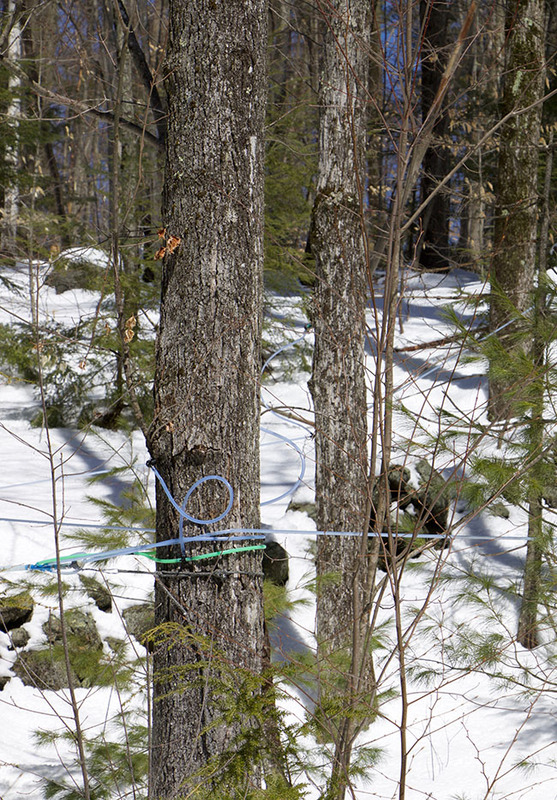 Today, no one uses buckets anymore, instead, a sugarbush is more like a modern plumbing system in a new house. Pipes are different colors, I guess different sizes. The can run a long distance through the woods, all ending up at the sugarshack where the sap, which looks and tastes just like water from a tap, is filtered and separated, then evaporated. The snowy woods looked so pretty in the April sunshine. 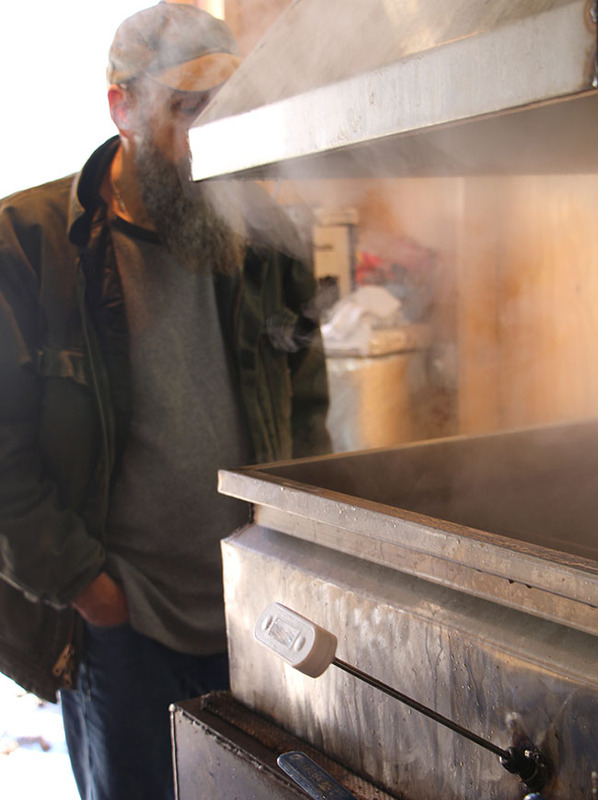 Joe watched the syrup boil at the Wells Family sugarshack, located on a quiet back road in southern New Hampshire, steam rises as maple sap is reduced down in a wood pellet fired evaporator. 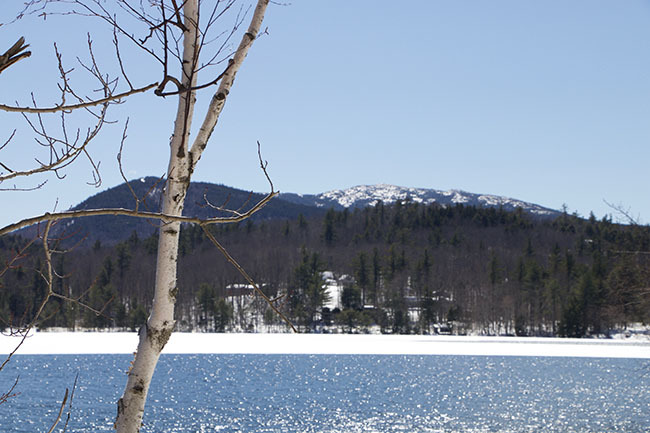 The sky was so blue and the sun so bright, that it felt more like June than April, but with a couple of feet of snow on the ground, it didn't take long to remember that this was just a late New England spring. 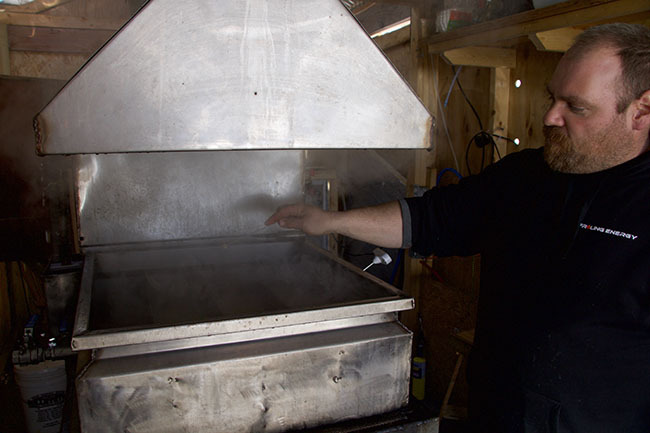 Proprietor Toby Wells explained to how he build his evaporator from scratch, and how challenging this years' sugar season was for many in New England as trees that were tapped too early 'healed up' by late February, and how most sugarshacks stopped producing a few weeks ago, unaware of a brief 'second season' brought on by late cold weather. Once the maples bloom, the season will end, which should be by this weekend this year. 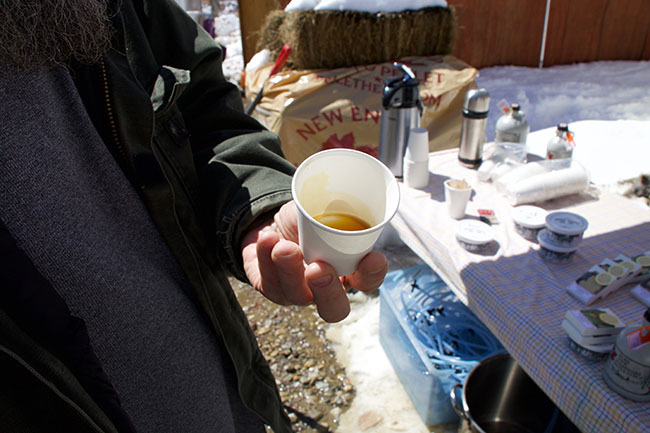 Toby Wells served us some warm maple syrup fresh from the evaporator - it was incredible, thick, sweet and hot - the perfect cough medicine, (well, a little bourbon in it may have been nice too!). On the way back home, we stopped for a late breakfast at a cool diner that served us a burger on a homemade maple bacon donut. (OK, it was weird and awful, and we regretted getting it, but it sounded good at first!). Mount Monadnock peaks over the distant hills here in southern NH. Back at home, the greenhouse was in bloom with spring treats like this Primula x Kewensis which is really beginning to bloom nicely under the protection of glass. 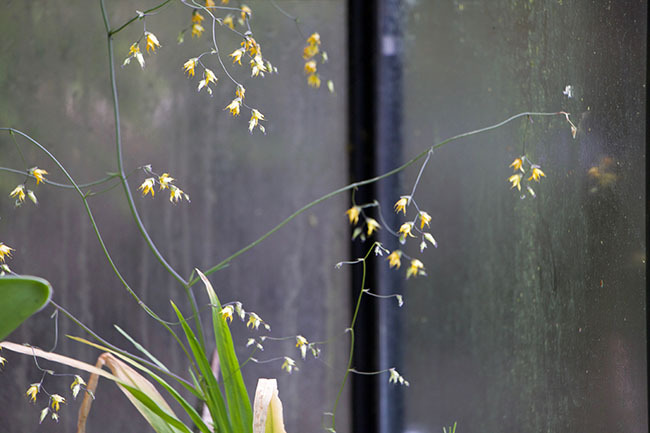 Melasphaerula raceamosa which self seeds through the greenhouse blooms in a random pot. I don't mind it's surprise bloom, for the corms are rare in most collections. 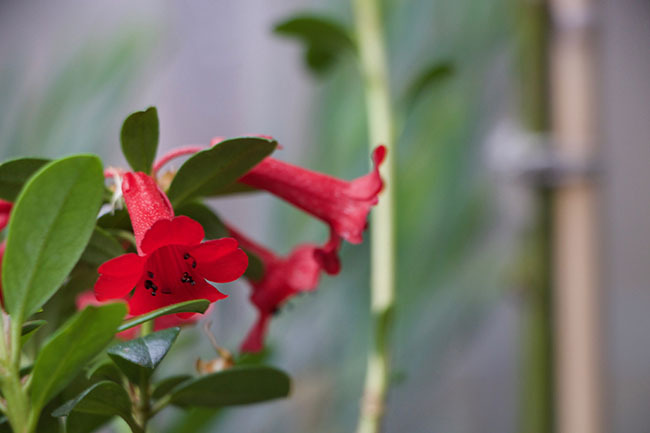 Tropical rhododendrons enjoy the cool temps in the greenhouse, and this is the first time this species has bloomed for me - Vireya 'Tropic Alpine' is a sub alpine form bred from selections native to the highest elevations of Mt. Kinabalu in Borneo. Another Vireya blooms below it on the bench, this one is R. 'Saxon Glow' or Vireya 'Saxon Glow', it always performs well for me under cold glass. 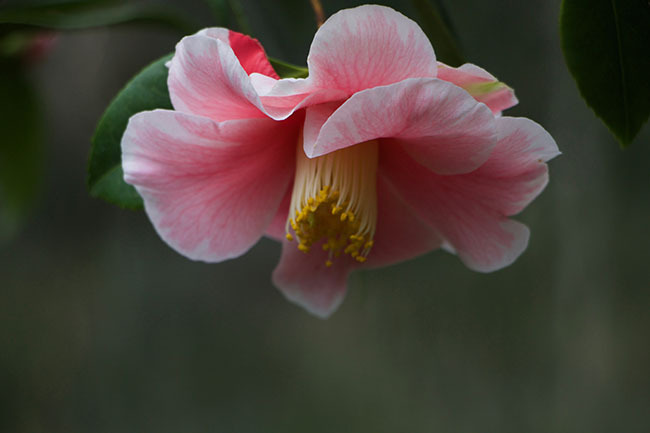 While on the subject of late winter blooming shrubs in the greenhouse, a few camellias to share - most of my plants are blooming very late this year. 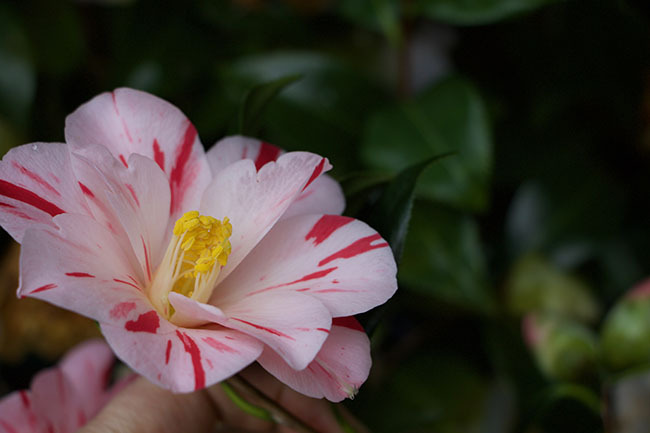 This one is another new one for me - Camellia 'Happy Harlequin'. I show this one variety all the time, but it's so beautiful, I can't resist - this plant won Best in Show last year at the Massachusetts Camellia Society show. 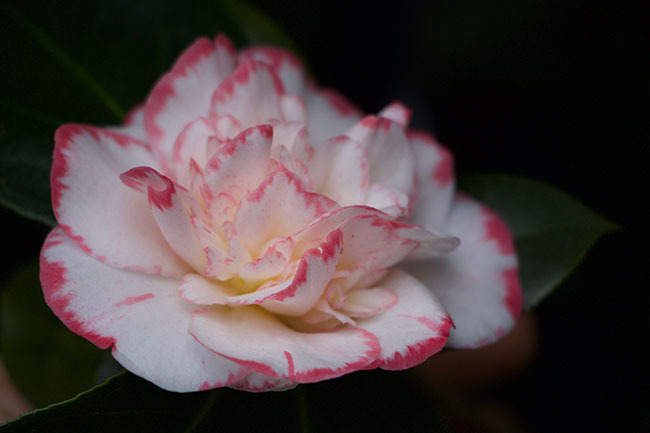 Camellia 'Margaret Davis', a parent of many show winners for obvious reasons. 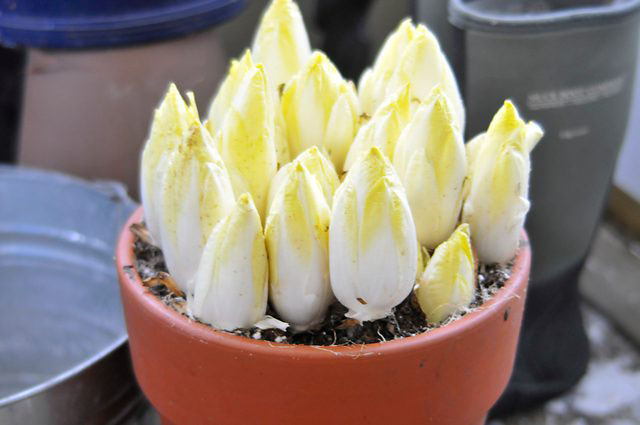 Lastly, the last of the Dutch bulbs are blooming after being forced in pots. I really like the floral form on this daffodil - which should be nicer in the garden (I did plant a few dozen outside this year, but saved a few to force too). 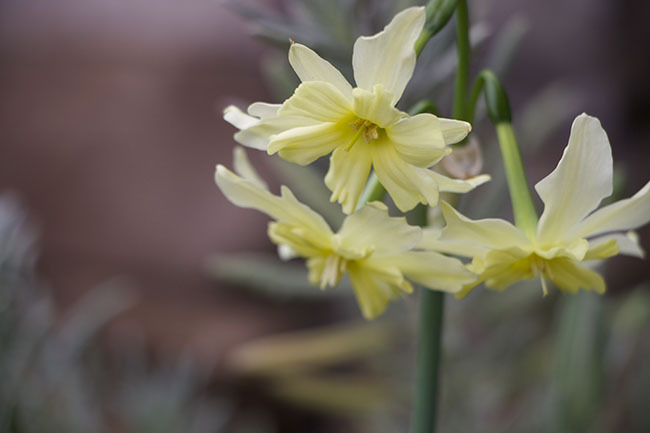 This one is Narcissus 'Exotic Mystery', I think it will look nice in the natural garden, as it is less showy than the big yellow honkers.